Most of you know that I’m a great advocate of journal writing. Yesterday’s journal entries are full of good things for the New Year. Every cell of my body is alive with creativity, alert to the power of the Cosmos, vibrating with hope. I am here to create processes!!! This is true. I exist to create innovative processes that remind us of our resourcefulness, wisdom, and wholeness. This is true! I’m alert and alive. My body is self-generating. Willingness to receive the creative spark. Willpower to carry out my part of the creative process to completion. A capacity to notice the truth, then to tell the truth without blame or judgement. Knowing when to be still and silent. Images came to me: the Ace of Wands from the Tarot of the Crone, the 7 of Fire from the Gaian Tarot, the One and 10 of Blades from the Daughters of the Moon Tarot. I was also shown four concentric circles, each stratum containing people cards from the Gaian Tarot: the Elders in the centre, the Guardians around them, the Explorers making up the third ring, and the Children on the rim. A colourful council of pictures to solidify the message I received in the Lower World. To keep me on track in 2011, I’ll post the messages I received in my journal and in my journey and keep images of the cards that came to me in full view. I wish all of you an empowering 2011. Blessed be! It’s a great week for launching new things just before we enter the new year. out in the world now, but my friend and colleague, Joanna Powell Colbert (creatrix of the Gaian Tarot) has a cool new programme to help you jumpstart the process of making your dreams and goals a reality. My Emperor Booklet is Available! I appreciate you referring your friends, students, and colleagues to this page as well. Thank you in advance. It’s customary at this time of year to exchange gifts with beloved ones (and sometimes with those to whom one feels obligated). The whole practice of shopping ’til it hurts for the sake of one day of the year repulses me; however, a few meaningful presents given in appreciation and love can be delightful. My boyfriend, a few friends, and some relatives gave me lovely items this Solstice/Christmas-tide. But the most wonderful gift I received from everyone was time, attentiveness, caring, and relaxed visiting. All of these, to me, feel in concert with the deep time of the year in which we find ourselves. For these gifts, dear ones, thank you. This beautiful exchange has been wondrous. Long may it continue. So far, it’s been a lovely and stress-free holiday-tide. I visited all my parents and my grandmother on Sunday, enjoying chats, food, and drink with all, then exchanged a few meaningful gifts. Yesterday, my friend Jeannette came over for drinks and nibbles and we had a gift exchange. The visit was leisurely and relaxed, a blend of depth and laughter (How’s that 9 of Clubs doing, Jeannette?). On Christmas day, Steven will cook Indian food and several of us will partake. Again, casual and stress-free is the mood that I anticipate. This is the quietest time of the year in Nature. Let’s remember that we’re part of Her. However you mark this sector of the calendar, may it be rich in every way. From Deborah Koff Chapin’s second deck of exquisite Soul Cards. May you be renewed at this time of the Sun’s rebirth. Blessed be! As we approach the darkest, longest night of the year from which the sun is reborn, I offer you this tarot game. In all honesty, it’s a council circle that employs tarot cards as talking pieces and visual conversation prompts. You can play the Winter Solstice Game with anywhere from two to 25 people, but I recommend that you keep the number of players to 12 or less. I designed it with tarot cards in mind; however, feel free to use Soul Cards, Medicine Cards, Heart Cards, or whatever you have. Whatever image/concept in any of these decks seems to be the most “solar” will be the group’s centrepiece (see Part A below). A nice touch is to enjoy a meal together after you’ve played the game. May you enjoy yourself as you deepen your connection with yourself, your beloved ones, and the rhythm of Nature. A. Gather in a circle, around a table, on the floor, or wherever you’re all comfortable. Remove the Sun card (Trump XIX) from the tarot deck and place it in the centre of the playing surface beside a beeswax candle. Light the candle. B. One at a time, each person receives the tarot deck as it’s passed clockwise. Each person, when s/he receives the pack, says one word or one phrase that lets the group know how s/he is as s/he enters this game (e.g. “I’m a bit tired this evening.” or “Feeling aligned with my best good.” or “Curious about what we’re about to do.”). Then s/he mixes the deck and picks three cards at random before passing the pack to the person on hir left. This continues until everyone has checked in and has three cards in their hands. 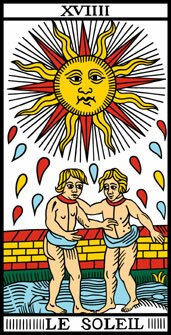 F. After everyone’s cards have been returned to the deck, the Sun card is shuffled back into the pack and the candle is extinguished.